Okay, so the many five stars for this book were warranted. It’s a heartbreaking, painful read. It’s also full of faith, strength, kindness and perseverance. I’m very glad I gave it a listen. The narrator is terrific and emotive and has the ability to draw you into the time and place instead of taking you out of it! 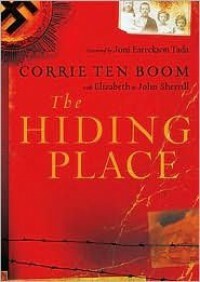 Corrie ten Boom is a 40 something spinster at peace with her quiet life. She is a watchmaker in her father’s shop and lives with her older sister and their kind father. She never expected to become embroiled in an underground revolution but when German soldiers invade her homeland and friends and neighbors start to disappear because they are Jewish or lending Jewish families safe harbor, she can’t stand by and do nothing. As conditions become increasingly worse for the unfortunate people in her beloved town, she decides to put her life in danger in order to save those of others. Her family has a hidden room built and they take in the desperate. Eventually she is imprisoned, along with most of her family. She recounts the long, grueling days of hellish conditions in prison and in concentration camps. The sickness, the starvation and the everyday cruelties inflicted. I’m not religious but these characters are and they walk with a strong belief and unwavering (for the most part) faith and a gratitude for everything, even ants and fleas, yet I never felt preached at. Their faith makes up a big part of who they were and how they managed to make it through the inhumane conditions. If you read this account, it will leave a mark on you for certain. It’s not a book I will easily forget.